It’s a Sunday morning, why don’t we talk about cookies? And by cookies, I actually mean “brookies”, a term made popular by a late night snack challenge on Australian Master Chef. This recipe is adapted from said Master Chef Australia 2016 recipe with some minor modifications. Oh, it’s the ultimate treat for chocolate lovers (i.e. everyone). 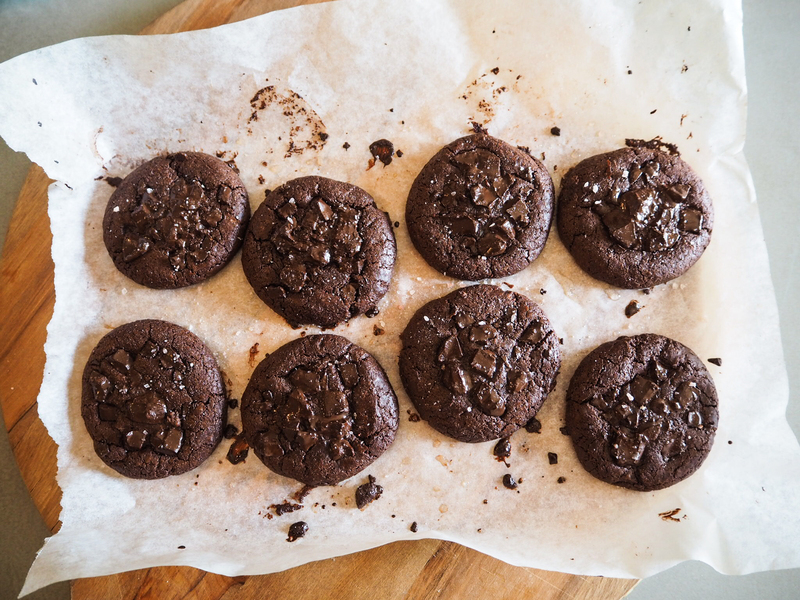 I am not always down for such absolutely indulgent desserts but, seriously, when taken out fresh from the oven, these cookies look just like they taste – INSANE. They’re sweet, soft, rich, gooey, and the chocolate chips will just ooze out upon touching. In short, it’s magic, except it’s pretty dark and all too real. Obviously, the type of chocolate you use is the determining factor of how the cookies are going to turn out. To me using dark chocolate in this recipe is essential, because it reshapes the chocolate flavour to be more balanced and delicate. I used 70% Lindt dark chocolate – trust me, it’s worth it. To cap off the flavour hit, I sprinkled some pink salt on the cookies, which helps to further refine and highlight the chocolate taste. Before you dive into baking these devilish delights, I have one important reminder: these cookies taste best when freshly baked – although I don’t think it matters, because they’d disappear into thin air within minutes. Using a double boiler, melt 350g chocolate with the butter until smooth. Remove the mixture from heat and let cool for 5 minutes. Add the remaining ingredients (but set aside half of the remaining chocolate i.e. 50g) to the chocolate-butter mixture. Beat the mixture with a whisk until well combined. Cover the dough with plastic and refrigerate for at least an hour. 15 minutes prior to baking, preheat the oven to 180C (356F). Roll the chilled dough into balls, and space each one about 2-inches apart on the sheet to allow space for spreading. Flatten the dough a bit with a spoon or your palm. Press the reserved 50g chocolate on top of each brookie dough. Bake for 10-12 mins. Remove from the oven and let cool. Sprinkle some pink salt and serve immediately (highly recommended! ).